Mark Dodge and Karn Myers have been working diligently to help the homeless, stray and feral cats of Los Angeles for about a decade. 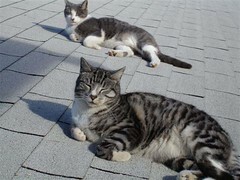 They started the Catnippers program as an umbrella program under the Best Friends Animal Society. Catnippers an all volunteer operation, is still going strong, but there’s a new program that isn’t just going to take a bite out of cat overpopulation; it aims to rip the problem to shreds. Fix Nation is taking the Catnippers model to a fulltime clinic dedicated to to spaying/neutering cats 5 days a week. "We’ve had a great relationship with PetSmart Charities and when they realized what a high percentage of animals killed in shelters are cats, they knew there needed to be a big spay/neuter push for all the homeless kitties out there," said Mark. Big it is! Fix Nation launched in July 2007 in temporary space and is building a permanent facility –a large space near the Burbank airport area. They’ve already hired a staff for current operations, with plans to expand into a one-stop-shop for all things feral. Since the PetSmart Charities donation was a matching funds grant, Best Friends is also a partner in helping this program come to fruition. "We’re delighted that Best Friends was excited about Fix Nation and wanted to get behind this new endeavor. We have had a wonderful relationship with Best Friends since the beginning, and Best Friends has been supportive all along the way. Now Best Friends, PetSmart Charities and other donors are partnering to help Fix Nation become a success. Catnippers and Fix Nation are also collaborating to help as many homeless, stray and feral cats in Los Angeles as possible," Mark continued. "Catnippers has been around a long time and the public is starting to really get to know us. The city refers a lot of people to us, and this is the program that gave feral cat caregivers a viable option. It’s volunteer driven," shared Karn. Karn indicated there were other organizations that are on board to help make Fix Nation a success as well. And success is measured in their eyes by systematically lowering the feral cat numbers throughout Los Angeles. They have been closely tracking feral statistics for the last 10 years. Everything from where a cat came in from, to medical history, to number of unborn kittens. They can point to a neighborhood and say that this population is stabilized and see the tangible accomplishments they have accrued. "The reality is that the kill numbers have declined steadily over the years. If you look at the ratio of number of people to number of animals killed in the shelters of Los Angeles, statistically it’s low. But I think we’ve hit a wall in getting to no-kill," Mark said. Fix Nation will be the exemplary program on how to treat the outdoor cat problem across the country. But massive financial donations are necessary to keep it going. 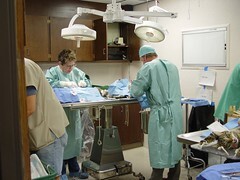 Being a full-time spay/neuter operation a clearinghouse for education, and supplies such as traps, food, feeding stations & shelters, and a full support system for the feral cat caregiving community, requires close to 7 figures a year to support. Donate or volunteer with Fix Nation. Join the Best Friends Los Angeles Programs. Learn how you can help the feral cats of your community. Access the feral cat section of the Best Friends Resource Library.